My local Immigration Office are confused about how to process my non-O visa using the 65,000/month system. I have already provided bank book and photostats of every page and a print out from my TransferWise account. They are saying their 'new boss' requires a full year's income which I have already provided but trying to convince them there is an agreement that only 3 months for this year is required as it has just been introduced. Anyway, they've kept copies of everything to calculate overnight and I need to return tomorrow. For years I've had the extension in my passport and home within an hour --- using the UK embassy letter. So, can somebody please give me a link to the Immigration statement giving the ''official'' guidelines as to what is now required. I can then print it and take it along tomorrow and keep in my file to use only if required. The confirmation letter of the bank is missing. What immigration office are you dealing with? Next week I'll be changing banks and have the book updated monthly after each transfer. Nakhon Phanom by the way. You need to request a bank statement for the past 12 months at your bank. There will be a fee for it may have to be sent from the main office in Bangkok. The letter only needs to verify you account and that is valid. That's the one; thanks indeed. Joe, for monthly foreign transfer income compliance for a retirement extension, isn't it also advisable to ask the bank for the foreign credit advice entries/statements of the person's various foreign bank to Thai bank deposits? Especially since the OP is talking about Transferwise transfers where the bank book or bank statement entries may or may not clearly show the foreign source of the transfers. Joe, for monthly foreign transfer income compliance for a retirement extension, isn't it also advisable to ask the bank for the credit advice entries/statements of the person's various foreign bank to Thai bank deposits? Those should not be needed if the transfers are shown as international transfers on the bank statement. I think it would be a bit of overkill to get one for each transfer. Another 12 bits of paper for immigration to look at. Especially since the OP is talking about Transferwise transfers where the bank book entries may or may not clearly show the foreign source of the transfers. That complicates things even more if the transfers are not shown as international transfers on the bank statement. Not sure if immigration would accept something from transferwise to prove it came from abroad. 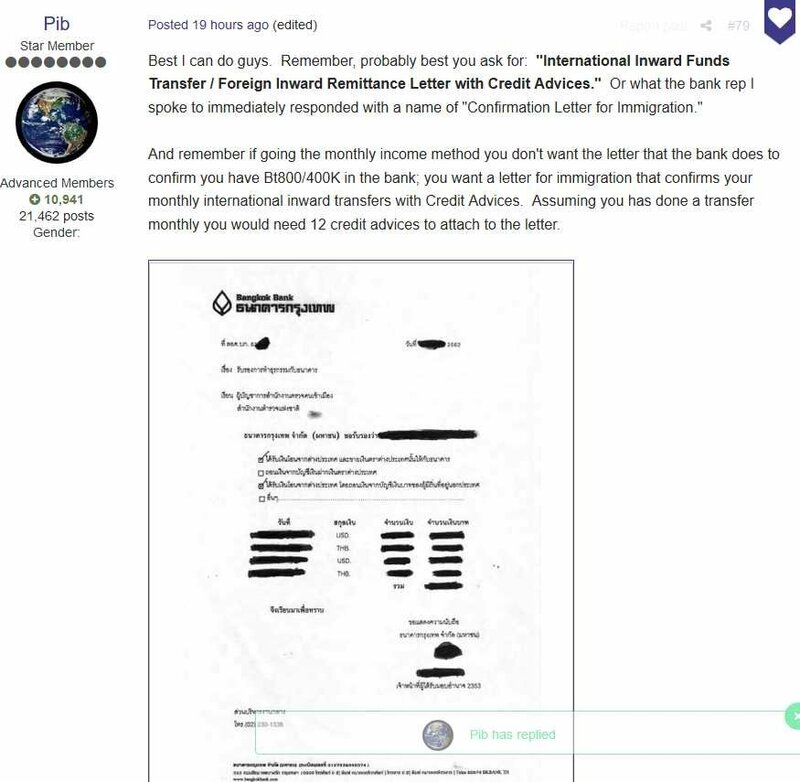 Joe, from what I've seen of some of the actual bank letters people have been getting lately and been posted in some of the threads here, the banks are basically summarizing the person's incoming foreign transfers as line items on a one or two page sheet. The account holder of course could get the full blown credit advice statements like Sheryl has shared here before. But the summary version seems to be what the banks are doing for this now for people who need to show incoming monthly foreign deposits. Between bringing a pile of Transferwise printouts vs. having a one or two page letter from my Thai bank certifying a list of incoming deposits as being foreign source along with the dates and the amounts, I'd choose the latter every time as far as what I'd want to be showing to Thai Immigration. In this regard, I always operate from the basic "better safe than sorry" mode. And as you know, the traditional, prior balance only style of Thai bank letters didn't deal with foreign deposits at all, and instead were just verifying account balance and ownership. But that's not what Immigration is looking for when it comes to proving monthly foreign bank deposits. And if it's not crystal clear from the bank book/statement entries perhaps because of Transferwise and/or as the OP mentioned not having regularly updated his bankbook and thus ended up with some summary entries, Immigration I'd imagine is going to want something else. 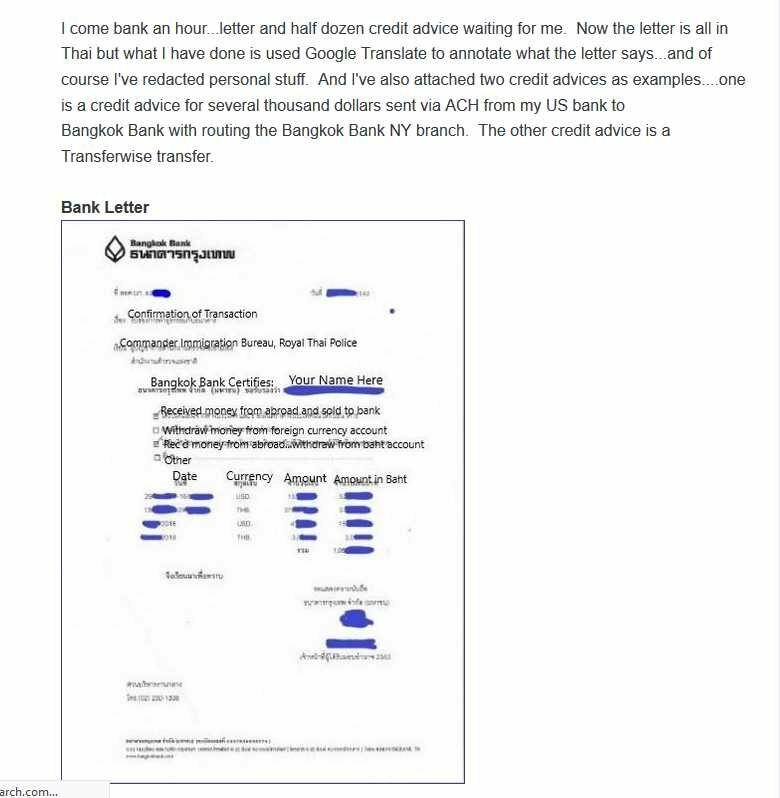 Joe, from what I've seen of some of the actual bank letters people have been getting lately and been posted in some of the threads here, the banks are basically summarizing the person's incoming foreign transfers as line items on a one or two page sheet. I have read about that could possibley be done but I have not seen a copy of one. No sure how the bank could firm the transfers unless they were done directly to that bank by transferwise. There have been so many topics about them the it is hard figure out what can be done.. There has been at least one report of a basic bank letter and bank statements being accepted. I think that is really all that immigration will be wanting since that is what it says in the amendment to the police order. I personally am of the opinion it is best to keep the amount of paper given to immigration a small as possible. If people really want to prepare for the extension application they should be transferring the funds directly into a bank account at a bank that receives SWIFT transfers without it going through another bank. For the OP and Joe, this below is an example of the kind of foreign transfer summary letter the Thai banks can prepare for Immigration. Re Pib's comment above, I think it's an open question of whether the summary letter alone would suffice, or whether Immigration would want to see all the individual credit advice letters. But no harm in getting them when getting the summary letter, just in case. I can recall that post but I am not sure everybody will be able to get one like that since they will not be going to the banks main office in Bangkok to get it. I believe in the KISS principle if possible. Not sure but immigration may accept my bank book that shows about 18 months of transfers with a FTT code on every one of them now. When I apply for my extension will have over two years of them in it. Without something in writing from the embassy it's seems that the confirmation letters, statements, and credit advices will not suffice. In my case they didnt work, and I had all the documents exactly the same as Pib provided on previous posts. You can try to prove to the IO the source of your monthy income/ pension, but you will always be at the mercy of the IO. Seems that Immigration does not want to deal with the different income scenarios. Eventually it's going to come down to the 400/800 method. Either you have the cash or you don't. If the Embassy of any particular applicant is still issuing Income affidavits/letters, then Immigration wants that. 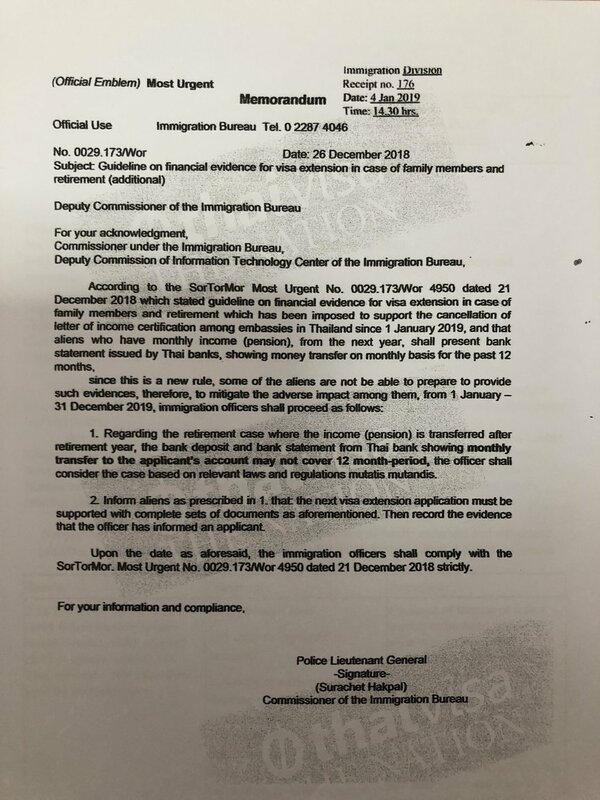 And ONLY if the applicant's country/Embassy is NOT issuing income letters anymore, then the monthly foreign bank deposits method and its associated documents can come into play. That appears to be the way the various Immigration offices are handling the new regimen.